Special thanks to Elle of Feeding My Enthusiasms and Deborah of Taste and Tell for hosting this month’s cheesecake challenge from Jill O’Connor’s cookbook, Sticky, Chewy, Messy, Gooey. For me, cheesecakes fall under the small category of mystical foods. It might just be my over-indulging tendencies, but it seems like I can never say no to a slice of heavenly cheesecake, no matter how full I am. Of course, in order to make myself feel better before taking part in one of the seven deadly sins, I always preface my request by asking for a tiny slice (adding more and more diminutive adjectives relative to how stuffed I feel at the moment). This is my second challenge for the Daring Bakers and, at first, I was ambivalent at the idea of making cheesecake. Upon reading the challenge, two annoying voices consumed my thoughts – one asked me to double the recipe while the other insisted that I halve it. Of course, there was no getting past the evil snicker behind the little devil persuading me to double it, so I fought my temptation and decided to half the recipe. As a college student, I cut corners wherever I can. In fact, I’m the student who will buy used text books not to get extra booze money, but rather to buy myself Crate & Barrel’s hottest serving platters. By admitting to my (sad, but true) weakness, I hope you will all understand why I had to cut out the middle stick: buy me! When I was given the liberty to create my own flavor combination (so long as I preserved the basic recipe) I started imagining a whole range of possibilities and decided to go with the classic orange-chocolate duo. 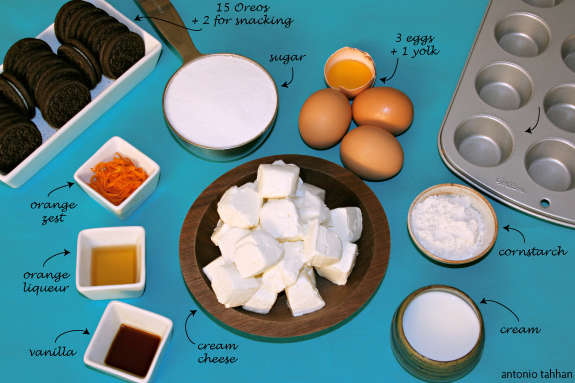 The chocolate, of course, is brought to you by yours truly, the ubiquitous Oreo cookie. Muffin tins are one of my favorite pans because they lend themselves perfectly for a variety of hors d’oeuvres (e.g. tapas), desserts or other tiny edibles. They also drastically cut down baking time, which I’m always a fan of. 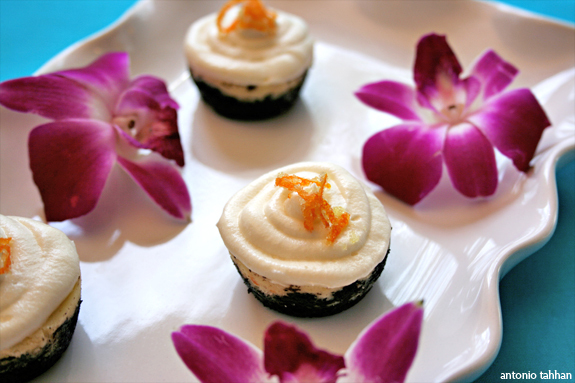 After inverting them, I decided to garnish each cup with a basic cream cheese frosting (1 part cream cheese, 1 part powdered sugar, 1/4 part butter, dash of pure vanilla) and sugared orange zest. To make the sugared orange zest, all you have to do is rub the zest of an orange with some sugar until the sugar turns orange and the air around you begins to smell like an orange grove. Melt butter and set aside to cool. Use some of this butter to butter your mini muffin tins. 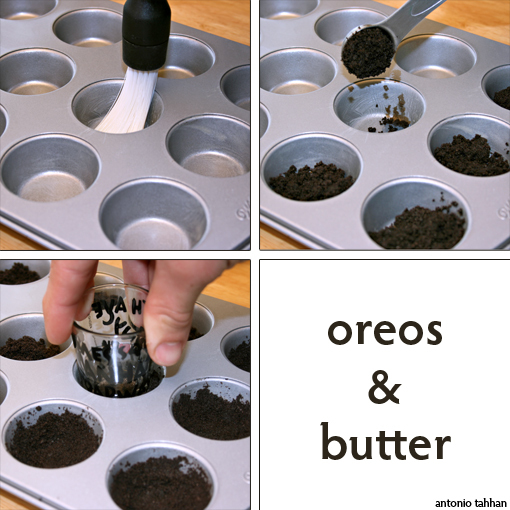 Crush Oreo cookies and mix with melted butter. Add one heaping teaspoon to each cup and compact with your favorite shot glass. Process all the ingredients (at room temperature) in a food processor until smooth. Fill each cup and bake in a water bath for 10-15 minutes. They should be slightly jiggly. Run a knife around the edges, cover with plastic wrap and store in your freezer until ready to decorate. 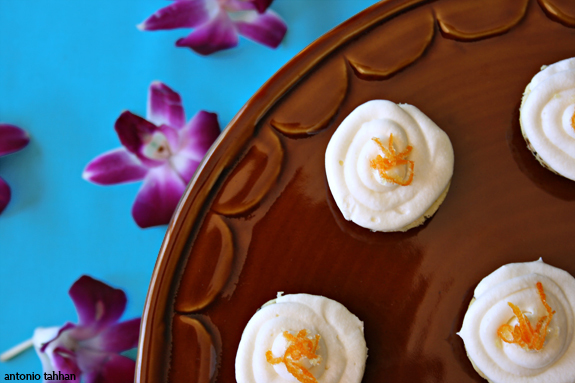 Decorate with your favorite Cream Cheese Frosting and top with sugared orange zest. Living in the godforsaken Ithaca tundra, I realized that despite how bad the weather is, there are always things to look forward to. In the spring, for instance, it’s regaining the sensation in my fingertips and the opening day at the farmer’s market. Last Saturday, the latter of the two was realized. The weather is still too cold for my liking; but a 40-degree high is certainly appreciated after such a brutal winter. Luckily, the rest of America is right on schedule with the commencement of spring and so I was excited to find ripe avocados calling my name at the store last week. After poking all of them to pick the ripest out of the bunch (don’t judge, I know you do it too) I bought 4; I used the first one to shoot the Avocado Milkshake Video, and the rest to experiment on an Avocado Pesto I dreamt up recently. Believe me, just like the milkshake, it’s a lot tastier than it sounds. The ingredients are similar to a regular pesto, but with minor alterations. The bulk of the greenness now comes from the avocado while the basil is merely a supporting actor in the whole production (I didn’t have the heart to exclude it). Then I decided to add lemon juice for zing and milk for a creamy touch. 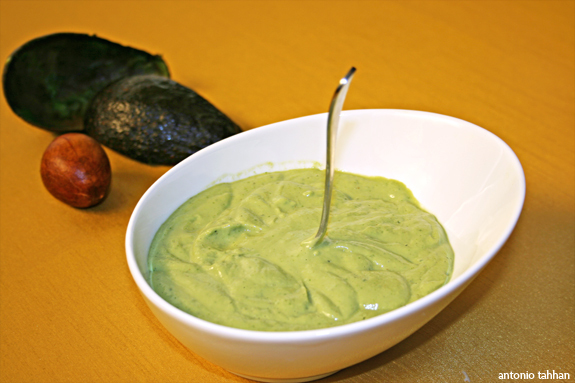 No, the sauce will not curdle because the natural fats in the avocado help keep everything together (clever, huh?). After processing everything together you’ll have a super thick sauce. No panicking is necessary as you’re only a couple steps away from pesto heaven at this point. The sauce will later be brought to consistency with pasta water, so just remember to reserve a cup before draining it. One of my favorite components of this dish is the vibrant forest-green color that the spinach takes on after sautéing. Of course, I keep it Italian by throwing in some toasted pine nuts. And if you don’t dig spinach, you can substitute arugula for a more peppery flavor that works out just fine (especially if you’re a big fan of arugula, as I am). 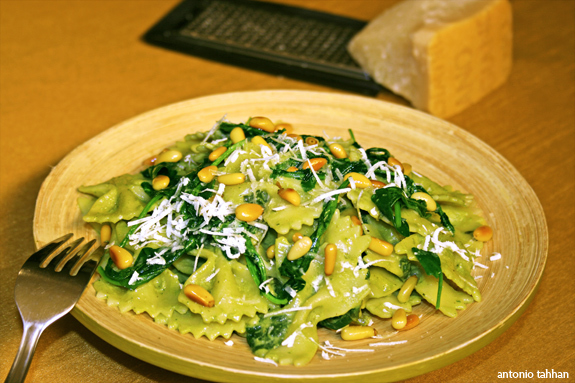 Once the pasta is cooked, reserve a cup of the cooking water and toss the pasta with the sautéed spinach and sauce. You’ll notice that the sauce is still very thick and this is completely normal. Incorporate the pasta water a little at a time until you reach the perfect consistency you’re looking for. In a large pot, cook pasta to specifications as directed on the package and set aside a cup of the cooking water. 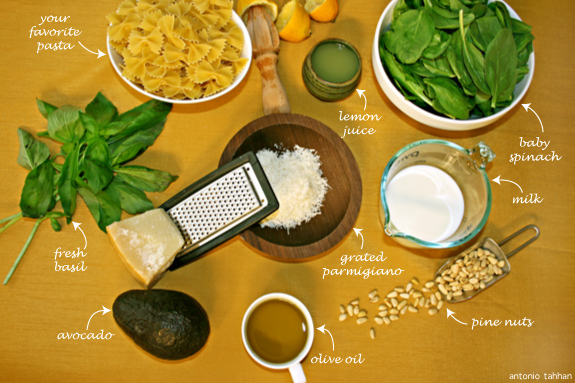 Blend the avocado, milk, basil, Parmigiano, 2 tbsp. olive oil, lemon juice, garlic and ¼ of the pine nuts until smooth to make the sauce. 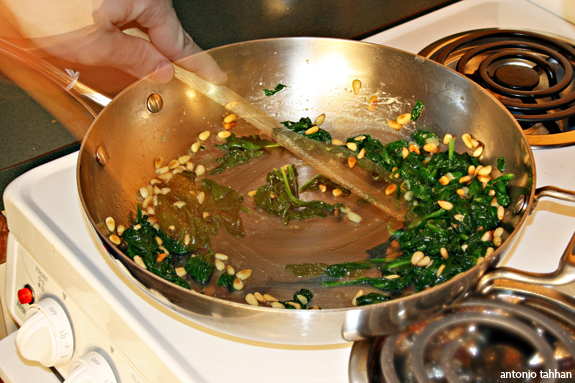 Using the remaining olive oil, sauté the spinach and the pine nuts just until the spinach wilts and turns a vibrant green. Toss the cooked pasta, sauce and sautéed spinach together and add a little of the cooking water at a time until you reach the consistency you like.